Have you ever thought about the implications of this verse? Jesus had just raised Lazarus from the dead, a sure sign that Jesus was the Messiah. Jesus was in Jerusalem talking to the crowd and all of a sudden there is what some people said sounded like thunder but some heard a voice. This was God confirming He was going to do what Jesus asked Him to do, to glorify God’s name. And yet many still did not believe Jesus. Why? John responds with the above quote from Isaiah that God has blinded them and hardened their hearts or they would have understood and turned to Christ and be healed. Wait a minute. Doesn’t God want people to believe the words of Jesus? Yes, but it wasn’t time yet. If the Jews in Jerusalem had all turned to Jesus He would never have been able to complete the task He was sent to do, to be crucified for our sins. 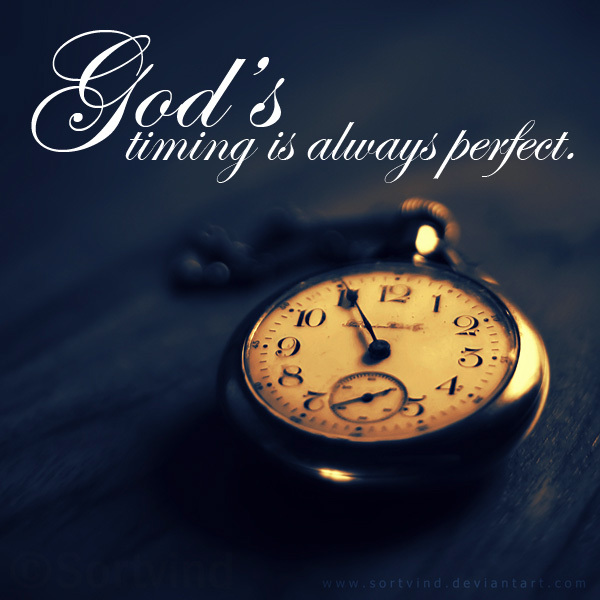 God timing is always perfect. In August of 2013, I was standing outside the sanctuary where I serve as an Associate Pastor and I felt the presence of God around me. I have had only a few instances where this has happened and I know to listen closely when it does. God gave me a strong sense that my ministry at The Ridge was coming to an end. God did not give a timeline or map out the next steps, I hate it when He doesn’t give me the details, but He just wanted me to be faithful and move when He told me to move. So, I did what He wanted me to do. When I felt Him telling me to reveal to someone where I was at I would do so. I would pray over openings at other churches and apply when I felt God telling me to do so. It has not been easy. I am not a patient person. I like to have my plans laid out nicely and thought through so that I can do what I need to do in order to make them come to fruition. Unfortunately, this can be done without God and without God’s timing. He is teaching me that while planning is important, there is a greater importance in trusting in God to work out the details and to walk by His spirit and not my own. One of my favorite verses has always been Ephesians 2:10. “For we are his workmanship, created in Christ Jesus for good works, which God prepared beforehand, that we should walk in them.” Today this verse holds even greater significance because I see God working out the details of my life and ministry and I need to walk in them. I don’t want to get ahead of God or fall behind. Another verse that God has recently put into my life is Nahum 1:7. “The LORD is good, a stronghold in the day of trouble; he knows those who take refuge in him.” This verse has reminded me that God is good. He has plans for me and I need to take my refuge in Him. Right now I know my time at my current ministry is over as of December 31st, but I do not know where my next ministry will be. This is a very scary prospect because I will not have any income to take care of my family as of January. As a planner and a financially minded person this is not normal. From the world’s perspective it is foolish, but from God’s perspective it is perfectly sane. The Lord is good. He has and He will provide. I just need to be faithful and find my rest in Him.